To be the safest, fastest growing, most intensive, and best run railway in North America. Offer customers superior service and creative transportation solutions to get freight delivered efficiently, on-time and with competitive value. Leverage our unique 351-mile rail corridor to “Own Florida” – moving more freight per mile than any other North American railway, and achieving the lowest unit cost per mile in the rail industry. Under new ownership of Grupo Mexico Transportes (GMXT), Florida East Coast Railway continues to focus on providing customers with high quality transportation solutions that connect America’s best state to the rest of the world. 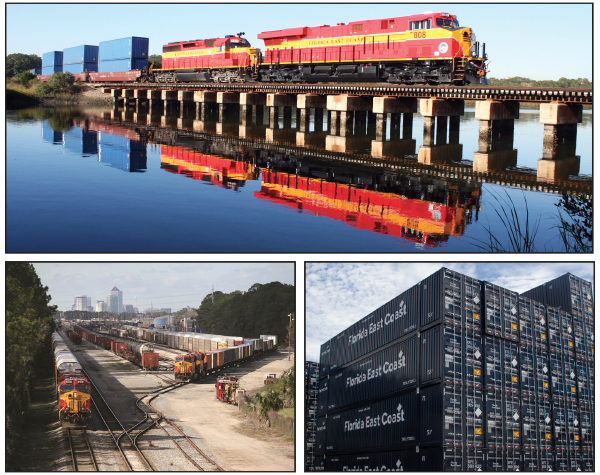 As the sole rail provider – operating 351-miles along the east coast of Florida – we offer intermodal, carload logistics solutions, and over-the-road trucking and we do it all in a safe, efficient, and reliable manner. We move a variety of carload commodities, including aggregates, automobiles, perishables, packaged foods, building and industrial materials, ethanol, bio-fuels and other petroleum products, offering 12 transload facilities along Florida’s east coast. Truck-like intermodal service provides shippers the convenience of door-to-door service and shipment tracing with delivery speeds that match that of trucking, but with greater reliability and reduced carbon emissions. Our regional trucking carrier Raven Transport provides line-haul, heavy-haul and tanker transportation services for the Southeast, Mid-West and Northeast, with operating authority to service all 48 contiguous states. We have multiple industrial development sites available to enhance your strategic position within Florida along our mainline track from Jacksonville to Miami, including parcels, and third party owned land and facilities.